A new research study suggests that four different genetic variants may increase the risk of suicide, disregarding environmental factors. The World Health Organization suggests that 800,000 people die from suicide each year and is the second leading cause of death among people ages 15-29. There are many environmental factors that can increase risk of death due to suicide, but it seems that genetics could play a major role. In fact, older suicide research suggests that heritability of suicide could be up to 50%. The article in Molecular Psychiatry used genomic techniques to identify genetic factors that may affect the risk of cancer. Scientists looked at 43 families that were at a higher risk for suicide, and by doing this they reduced the affect of environmental factors on individuals. Analysis of 1,300 DNA samples from people that died by suicide suggests that specific variants in SP110, AGBL2, SUCLA2 and APH1B could be responsible for raising suicide risk. The team also identified 207 genes that could influence suicide risk. I find this research article particularly interesting because suicide is not usually looked at in this light. Typically, suicide is seen as mainly a mental health issue not a genetic health issue. Although it do agree with how his study was performed, I do see other limitations to the study. The article highlights that the study was only conducted in one area of Utah, where the residents were mainly of Northern European descent. I think that further research needs to be done in other areas of the world and with other ethnicities to see if these same conclusions apply. This research is a step into understanding individuals that we think are “troubled” and perhaps with some genetic counseling, they can improve the health of these individuals. I agree that further research should be done to support the conclusion the researchers made. This would be an amazing breakthrough for people with depression and other mental health disorders. Many people don't believe that mental health disorders involve scientific reasoning and actual problems with the human body. Some people believe that people who are depressed or even get as far as committing suicide did not have a serious problem, but instead created their own depression. If it could be proven that these issues are embedded in our genetic makeup, it may open a lot of people’s opinions and change their judgement. I believe that if the study were to be expanded on a good sample group would be students from multiple different universities across the globe. The environmental factors that are present at different universities not only in the US and Canada but also overseas in Europe and also south America. 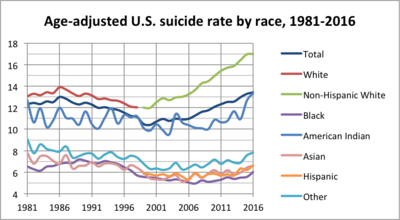 Since the gene pools differ all over the world for the human race it would be interesting to see what the statistics are for these suicide genes across the world and especially for college students where suicide is most prevalent.